Ever since I was a child, I have been hearing stories about how everything in Texas is bigger—the land, the people, the legends, everything. The more time I spend in Texas as an adult, the better I understand how this mystical aura of greatness came to be. Based on a mixture of fact and fiction and imagination, it’s an element of the Texas character that is indisputable. Recently I visited the sites of two of the most famous events in Texas history—the Alamo in the middle of downtown San Antonio and the San Jacinto battlefield in the bayou country immediately southeast of downtown Houston. Legends surround both locations, and with good reason. An old Spanish mission dating from the eighteenth century, the Alamo won immortal fame when 189 “Texian” defenders led by larger-than-life figures William Travis, Jim Bowie, and Davy Crockett held out for 13 days against 1,500 Mexican troops under the command of General Antonio de Padua María Severino López de Santa Anna y Pérez de Lebrón, more commonly known to history as Santa Anna. The fall of the Alamo, in which every defender died, has been depicted in many films, the most famous of them being Walt Disney’s “Davy Crockett, King of the Wild Frontier” in which Fess Parker played the title role. Every American child of my generation has a picture permanently etched in their mind of Parker/Davy Crockett, clad in buckskin and wearing a coonskin cap, standing atop the ramparts of the Alamo swinging his Kentucky long rifle as the troops of Santa Anna close in for the kill. Visiting the actual site of the battle left deep impressions. One of the first is the modest size of the iconic chapel itself. It became clear during my visit that the grounds and perimeter of the mission as they stood in 1836 extended well beyond the chapel itself. Only a few bits and pieces of the surrounding buildings and defense works from the Siege remain today. Still, walking across what to Texans is hallowed ground was breathtaking. The grounds of the Alamo today are a lush oasis crowded in on all sides by the modern city of San Antonio. One must stretch their imagination to picture it as a field of battle. 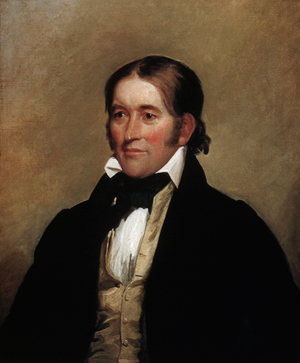 Separating the legend of the Alamo from its actual history required me to set aside many of the colorful, Disney-esque details I once embraced, starting with Davy Crockett. According to recent historians, Crockett wore an ankle-length brown greatcoat during the final defense, not buckskins. Even more surprising to me, scholars now insist he did not die during the assault itself. Rather, some now argue, he surrendered, along with a score or more of his fellow defenders, all of whom were executed shortly thereafter on the order of Santa Anna. I fear that some of my Texan readers may take umbrage with this debasement of the Crockett legend. Nobody can question, however, the bravery and sacrifice of Crockett, Travis, Bowie, and their fellow “Heroes of the Alamo.” My visit to the Alamo only deepened the sense of awe I feel about the sacrifices they made in the name of freedom. If there is one man whose legend looms larger in Texas lore than that of Davy Crockett, it’s Sam Houston, soldier and statesman and commander of the Texian forces that defeated Santa Anna at San Jacinto two months after the fall of the Alamo, winning independence for the land they loved. I remember a Landmark book from my youth entitled “Sam Houston, the Tallest Texan” which recounted the colorful details of Houston’s life in the most vivid of terms. In 1930, American journalist Marquis James was awarded the Pulitzer Prize for his work “The Raven: A Biography of Sam Houston” in which he added considerably to the legend of Sam Houston. The tie between James and Houston brought the story of San Jacinto close to home. An uncle of mine by marriage was a close friend of James and a huge fan of Sam Houston. He compiled a notable collection of Texana which was purchased by Jesse Jones of the Houston Endowment Fund and donated to the San Jacinto museum in 1948. During my visit to the monument in August I had a chance to poke around in the archives kept in the library there, where I found a picture of said uncle seated along with Andrew Jackson Houston, Sam Houston’s surviving son, on the speaker’s dais at the dedication of the San Jacinto Battlefield Monument in April 1936 on the 100th anniversary of the battle. In those same archives, I came upon documents and images associated with a direct blood relative of mine, Albert Sydney Johnston, who served as a private in the Texian army in the Texas War of Independence in 1836 and later as a general in the Army of the Confederacy during the American Civil War. He lost his life at the Battle of Shiloh when he was shot in the leg from behind, probably by one of his own troops as he led a charge against Union forces in the bloodiest battle in American history up till that time. The archivist at the museum informed me that, as a blood descendant of General Johnston, I qualified for membership in the Daughters of the Republic of Texas, a formidable honor. 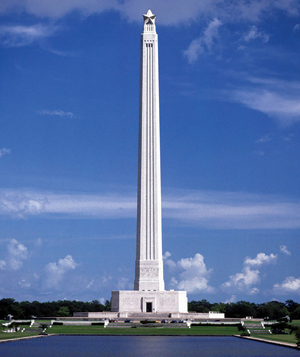 The details of Houston’s victory over the forces of Santa Anna are on full display at the San Jacinto Monument and can be experienced as well on-line by visiting the museum’s website, http://www.sanjacinto-museum.org/Monument/. While looking through the papers from my distant uncle’s collection held at the museum, I came upon two stirring documents related to Texas history. 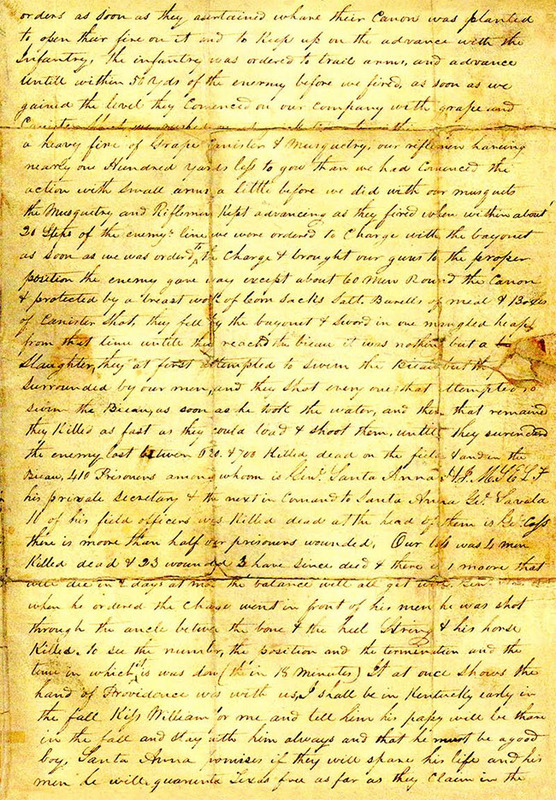 One was an original letter written on the San Jacinto battlefield by one of Sam Houston’s soldiers two days after their victory. 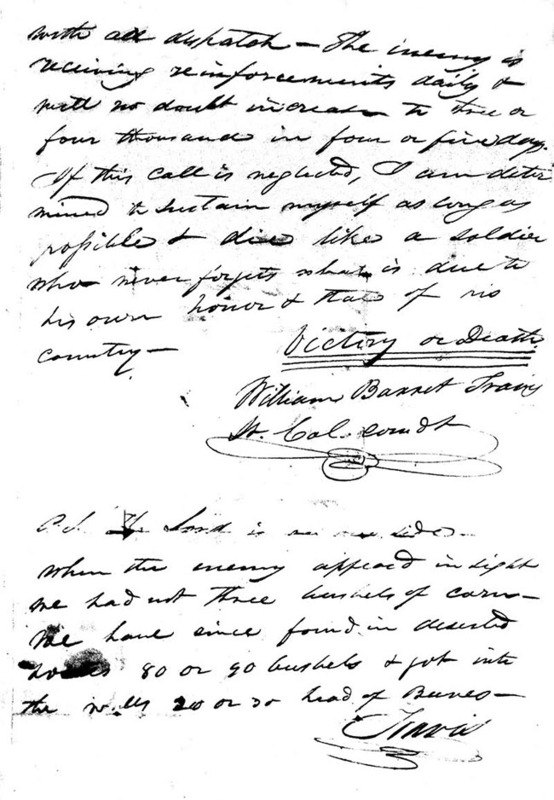 The other was a photostatic copy of the letter Col. William Travis wrote from the Alamo calling for loyal Texians to come to the aid of his besieged garrison. The words of those two documents speak eloquently for the men who wrote them and the sacrifices they made. 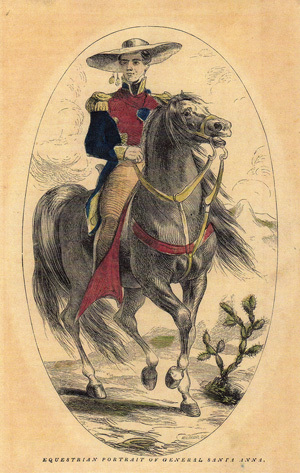 Fellow citizens & compatriots— I am besieged, by a thousand or more of the Mexicans under Santa Anna—I have sustained a continual Bombardment & cannonade for 24 hours & have not lost a man—The enemy has demanded a surrender at discretion, otherwise, the garrison are to be put to the sword, if the fort is taken—I have answered the demand with a cannon shot, & our flag still waves proudly from the walls—I shall never surrender or retreat. Then, I call on you in the name of Liberty, of patriotism & every thing dear to the American character, to come to our aid, with all dispatch—The enemy is receiving reinforcements daily & will no doubt increase to three or four thousand in four or five days. If this call is neglected, I am determined to sustain myself as long as possible & die like a soldier who never forgets what is due to his own honor & that of his country. P.S. The Lord is on our side. When the enemy appeared in sight we had not three bushels of corn. We have since found in deserted houses 80 or 90 bushels & got into the walls 20 or 30 head of Beeves. On March 6, eleven days after Travis wrote his letter, Santa Anna ordered his final assault on the Alamo. One bloody hour later, every defender lay dead, and a timeless legend was born. In my last letter I informed you that I should start the next day for Gen’l Huston’s [sic] camp and join him on the Colorado river. The Mexican army was then encamped on the opposite side of the river 3000 strong. Huston’s army was, including our 2 companies, 1372 men. The next day after we joined him he commenced a retreat back on the River Brasas, 15 miles above the town of San Felipe de Austin (which Gen. Huston had burnt). The second day after the site of San Felipe was occupied by the Mexicans army, Gen. Huston stationed 3 companies on the river opposite town to prevent their crossing. Santa Anna sent a detachment of 500 men to a ferry below San Felipe called Fort Bend and crossed them over, and then sent the remainder down to the same place and crossed his whole force. Santa Anna stationed 2500 men at Fort Bend and took 500 of his veterans and one heavy brass nine pounder and pushed on to Harrisburg on Buffalo Bieau, 35 miles from Fort Bend, on his way to Galveston Island, the only port the Texans now have in their possession. Huston immediately crossed the Brasas and took up his march for Harrisburg, distant 57 miles. We got to the bieau opposite Harrisburg in the evening and Santa Anna had left it that morning for Linches Ferry on the road to Galveston. Next morning our spies brought in the Mexican mail rider and the mail from which we learned that Santa Anna was with the army in person. Gen. Huston had been compelled to give furlows to upwards of 200 men to go and carry their families beyond the Trinity river for security and one entire company that was left opposite San Felipe went instead of joining us on our march. When we reached Buffalo Bieau we had 810 men and before we were through examining the letters our spies crossed the bieau, brought in the colonel commanding the Mexican cavalry with a letter from Cos to Santa Anna stating that he would start the next morning from Fort Bend with 650 men to join him at Linches Ferry on Buffalo Bieau. Gen. Huston then knew that Santa Anna had gone by way of New Washington on the bay to destroy that place and then to march up the Bieau to Linches Ferry and join Cos and march on to Galveston and take it before Huston could find where he was, leaving the main body at Fort Bend to amuse Huston. Gen. Huston crossed the bieau next day with 520 men and the two 4 pounders that reached up on our march from the Brasas and left the balance to take care of our baggage and guard the camp. We lay in the bushes on the road to watch Cos and the 650 men which were expected to pass that day but did not. As soon as it became dark we commenced a rapid march for Linches Ferry, calculating that Santa Anna would not cross the Bieau until the arrival of Gen. Cos. At two o’clock a.m. we halted within 2 1/2 miles of Linches ferry. At sunrise on the 20th ultimo we formed our line of battle and proceeded to the ferry. When we reached the ferry we found Santa Anna had not yet reached there, but was on his way up from Washington. Huston picked his ground, placed his men, gave them his orders, then made them stack their arms in their places and told them to eat their breakfast and be ready to receive them about 11 o’clock a.m. They came in sight drawn up inline, 400 infantry and 100 horses with their 9 pounder in the center of their infantry. At about 350 yards distant they opened on what few they could see of us with their cannon charged with grape and canister shot, but we were protected by the timber and sustained no injury except one man slightly wounded. They did not know we had a cannon and their fire was not returned until their infantry commenced their fire with musketry. We then commenced with our cannon, hoping they would charge with their infantry to take them, and by that means we could cut them off and if possible take Santa Anna prisoner, or kill him. They retreated from our fourth fire of the cannon to a small wood in our front where their cannon was planted and kept up a fire with their cannon until 1 o’clock p.m. when they fell back to a piece of high prairie in front and immediately commenced fortifying with brusk, baggage, etc. Huston then determined to come out in the plain and engage them. The cavalry was sent out to draw the enemy from their cover, but we could not get them to attack us. It being late in the afternoon, Huston decided to defer attacking them until morning and marched into camp. That night Cos arrived with 650 men and joined Santa Anna, making his force 1150. Santa Anna then considered Huston and Texan then in his power with no chance to escape, and that he would let Cos’ men rest one day and on the morning of the 22nd seal the death warrant of Texas by the destruction of Huston and the only men Texas had in the field. At half past 3 o’clock of the 21st ultimo we left our camp and attacked him leaving one company of 38 men in camp. Our cavalry about 110 strong was posted on the right, the 2 companies of regulars next to the cavalry, the 2 companies of volunteers on our left and the militia on the left. Opposite the woods about 300 yards in their front was a bottom that protected us from their cannon. In that hollow we formed our line with our two 4-pound cannon (presented to Texas by the ladies of Cincinnati, Ohio) in the rear of the regulars with orders as soon as they ascertained where their cannon was planted to open fire on it and to keep up on the advance with the infantry was ordered to trail arms and advance until within 50 yards of the enemy before we fired. As soon as we gained the level they commenced on our company with grape and canister and musketry. Our riflemen having nearly 100 yards left to go then we had commenced the action with small arms before we did with our muskets. The musketry and riflemen kept advancing as they fired. When within about 20 steps of the enemy’s line we were ordered to charge with bayonets. As soon as we were ordered to the charge and brought our guns to the proper position the enemy gave way except about 60 men around the cannon and protected by a breastwork of corn sacks, salt, barrels of meal, and boxes of canister shot. They fell by the bayonet and swam in one mangled heap from that time until they reached the bieau. It was nothing but a slaughter. They at first attempted to swim the bieau, but were surrounded by our men and they shot every one that attempted to swim the bieau as soon as he took to the water, and them that remained they killed as fast as they could load and shoot them until they surrendered. The enemy lost between 620 and 700 killed on the field and in the bieau, 480 prisoners among whom was Santa Anna H-I-M-S-E-L-F, his private secretary, and the next in command to Santa Anna, De Savala. Ten of his field officers were killed. At the head of them is General Cos. There are more than half of our prisoners wounded. Our loss was 4 men killed and 23 wounded, three have since died and there is one more that will die in two days at most. The balance will get well. Gen. Houston, when he ordered the charge, went in front of his men. He was shot through the ankle bone and the heel string and his horse killed. To see the number, the position and the termination and the time in which it was done (time 18 minutes) it at once shows that the hand of providence was with us. I shall be in Kentucky early in the fall. Kiss William for me and tell him Pappy will be there in the fall and stay with him and that he must be a good boy. Santa Anna promises if they will spare his life and his men he will guarantee Texas free as far as they claim in the Declaration of Independence. Couriers start in the morning to order all Mexican troops in Texas to fall back on St. Antonio and Gonzales until preliminaries are settled & one after the President of Texas to come to our camp and treat with the tirant [sic] and his fate and that of Texas sealed. Huston says that every man that was in the battle shall have 2 leagues of land. The boat is going and I must stop. I will write again in a few days. I remain your affectionate brother. 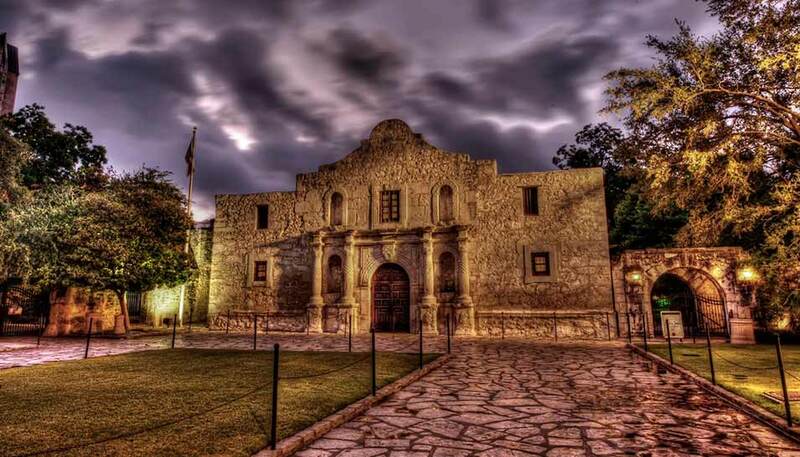 According to other accounts of the battle, Houston’s men cried out, “Remember the Alamo!” as they slaughtered Santa Anna’s troops on the battlefield and in the “bieau” at San Jacinto, taking a mere eighteen minutes to exact their revenge.